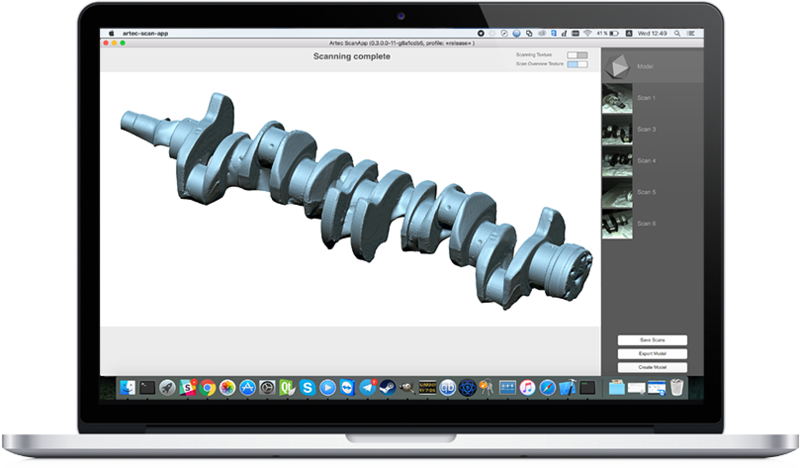 ​Artec ScanApp is a brand new Mac OS application, which allows users, for the first time ever to capture 3D data with Artec Eva 3D scanner directly on a Mac. This 3D software, designed specifically for Mac OS, features a new, easy way to scan, as well as a clean, ergonomically designed interface, perfect for new Mac users and a breakthrough for 3D technology. ​3D scans can be aligned directly in the program or exported for more advanced processing and editing on a Windows PC using Artec Studio, a smart and powerful 3D software, perfect for data modeling, design and more. The final model is compatible with a range of the most popular reverse engineering and 3D modeling programs, which makes it a perfect tool for creating new product designs in 3D. Artec ScanApp presents Mac users with a simple and intuitive way to make digital 3D models which can serve as the basis for customizing existing products using 3D modeling and design software. ​As you scan your object, the data is processed automatically in front of your eyes. You can see which parts of the object’s surface have already been captured and where you should move the scanner next. Artec ScanApp ensures the same high quality of scanning in Mac OS that is available to Windows users scanning in Artec Studio. ​3D scanning with ScanApp is easy to pick up, thanks to the new color prompter. During scanning, the color of your 3D model tells you if you are holding your 3D scanner at the ideal distance from your object. When you are holding Artec Eva at the correct distance from your object, your 3D model will be green. If you are holding the 3D scanner too close to your object, the area on your 3D model will turn orange/red. If Artec Eva is too far from your object, you will see the color blue on your 3D model. The scans produced by the 3D scanner are aligned automatically, eliminating the need for the user to go over each scan and assemble them manually. This reduces the time needed for alignment from minutes to seconds. In ScanApp the geometry and texture of an object’s 3D image are rendered exactly as they are in real life, with smooth and clearly outlined shapes, high definition geometry and natural colors. Export raw data as multiple scans for further processing in Artec Studio, or save the data as a 3D model. Artec Studio gives you the flexibility of enhancing and modifying your 3D model to meet your exact application requirements. This brand-new 3D scanning software is an ideal solution for when you are away from your workplace and need to do some professional scanning on OS X. 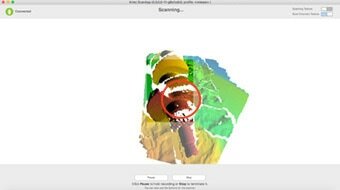 Quickly and easily capture all the 3D data with your Artec Eva and your Mac, then on your return to the lab, export the data to Artec Studio for the extensive processing tools. 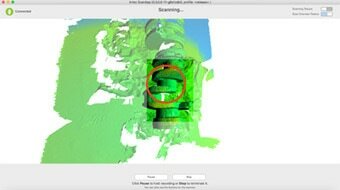 ScanApp enables Mac users to have powerful 3D software readily available for capturing high quality data for consecutive use in modeling design and analysis. Perfect for both indoor and outdoor use, this comprehensive software can streamline workflow in various industries, including industrial engineering, healthcare, automotive, aviation, and more. All you need is an Artec Eva. If you want to do extra processing on your model, then you will also need Artec Studio. Artec ScanApp is compatible with OS X Yosemite, El Capitan and Sierra.